"For the Best websites the easiest way, when you need professional quality yet want to maintain control over the design and functionality, it is hard to go past Serif's WebPlus X6. Winner of over 200 international awards, the X6 series has transformed the websites and the livelihood of hundreds of thousands of small to medium enterprises. Now in its sixth generation, it handles mobile devices and social media out of the box, with built in templates for everything, all easily customisable, yet solidly built, without the need to learn any coding whatsoever. That's what particularly impressed us. The end result is indistinguishable from some of the best websites we've seen at any price...a seamless web presence that looks as though a professional team has built it from scratch, at some expense, but without any ongoing costs, which is where web designers typically make the most profit. Because once completed, sunk costs, training (and the risk/effort of finding someone better) prevent many businesses from jumping ship from what they've already known, no matter how badly they need to. Serif changed all that, at the most meagre of upfront costs, now under $120. Serif is earning the awards it is getting, with enterprise-quality and attention to detail. Very impressed indeed." 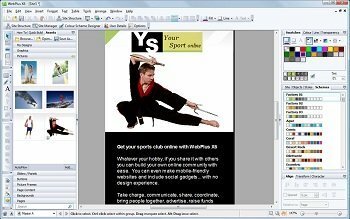 WebPlus X6 is the quick and easy way for small to medium enterprises, local businesses, clubs – in fact anyone – to create and publish eye-catching desktop and mobile sites, without having to use any code. 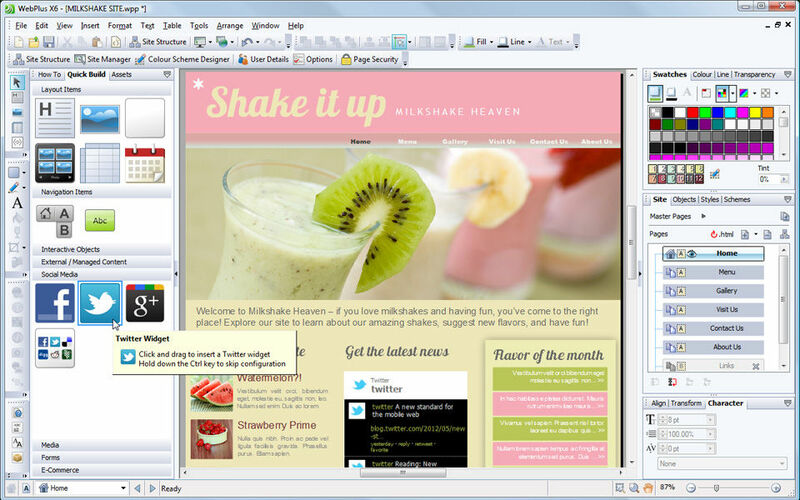 Whether using stylish templates or designing from scratch, WebPlus X6 lets regular computer users add advanced features to unique sites with drag-and-drop simplicity. 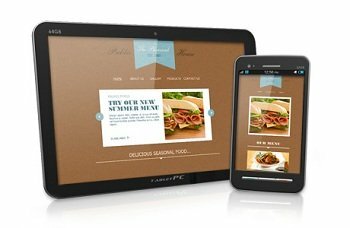 It’s ideal for creating pages optimised for any device, and has all the power and flexibility you need to make a professional website. If you need a website, but don’t want the expense and hassle of hiring a web designer, use WebPlus X6 and find out how easy it is to create something you’ll be proud of. WebPlus X6 makes it easy for you to create your own website, even if you’ve never made one before. You don’t need to know how to write code or do anything technical. Simply drag and drop pre-designed objects like buttons, navigation bars, logos, photo galleries, banners, backgrounds, and more onto your page where you want them. To complete your site, just add your own text and pictures. The whole process is intuitive and, if you’ve used other office software, you’ll quickly become familiar with WebPlus X6. Your visitors will never know if you’re a total beginner. The templates and themed layouts in WebPlus X6 are professionally designed, so you know your site will look great from the start. They are easy to customize and there’s an endless range of color schemes so you can use them to create any type of website. 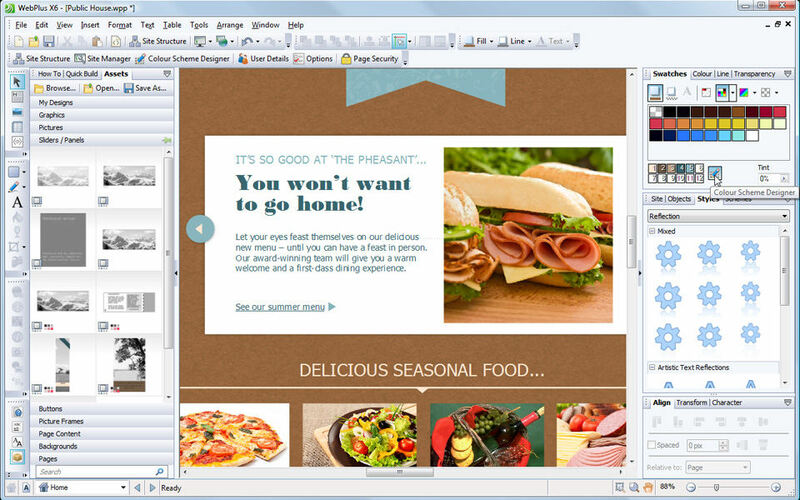 Simply open a template, add your own text and images, and then upload it to the web. Of course, you can always customize the template to suit your needs or start with a blank page and design a completely unique site. Making a professional website has never been this easy. Once you’ve finished designing your site, the automated Site Checker scans and either fixes or alerts you to potential problems so you can make the best site possible. When you’re ready, preview your fully-functioning site in any browser to make sure you are happy, then upload your site to any host, or use Serif’s easy web hosting. One-click publishing makes the process easy and means any changes you make can be live almost instantly. Publish all your files securely in one go, or just the most recently made changes. 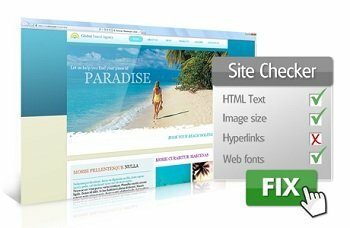 Unlike other website designers, WebPlus X6 simply has everything you need to create a professional website. There’s no need to buy or learn other programs. Create an unlimited number of sites and pages full of anything you like. There’s built-in photo editing, help whenever you need it, and tools for designing logos, buttons, navigation bars, and banners. You can always use the pre-made ones too. With WebPlus’ full suite of design tools, easy publishing, easy hosting, and site management, you really don’t need anything else to create a website and get it live online. Browsing on mobile devices like smartphones and iPads is really popular. With WebPlus X6, you can design your full-size website at the same time as a version optimized for mobile browsing – and add automatic redirection based on device type or screen size. There are attractive matching templates for both types of sites, but they’re easy to design from scratch to suit any need. 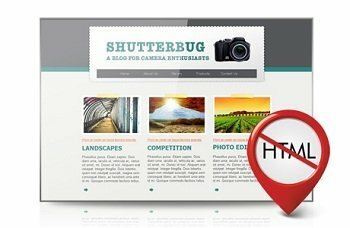 Mobile-friendly buttons and graphics are included to optimize pages for mobile browsing, and the sliding banners and photo galleries work beautifully on desktop computers, Android devices, iPads, and iPhones. Keep your visitors coming back to look at fresh content like videos, news feeds, polls, and more. Just drag and drop the gadgets you want onto your site, no expertise required. Display Facebook and Twitter feeds, complete with Like/Follow/+1 and other link sharing buttons, stream YouTube and other videos, add podcasts, blog, and make changes from any internet-connected device. We’ve made it all really easy to do with no programming or complicated set up. Online shopping is massive and still growing, and WebPlus X6 makes it easy for you to take card payments on your website. 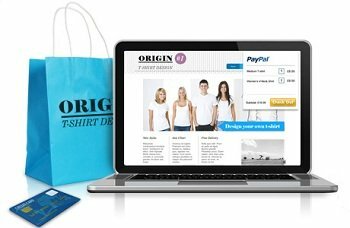 We’ve teamed up with trusted shopping cart providers like PayPal, or you can add your own preferred cart, so you know online shopping will work smoothly and your customers will know their details are secure. It’s a cinch to set up a store on your website: a wizard takes you step-by-step through everything you need to do. Add as many items as you like, give your store a popup cart, even include color, size, and other product options. You could be selling your products and services worldwide in minutes. Make sure your customers can find you online with the built-in SEO (search engine optimization) features, then make sure they can find you in real life by adding a Google Map to your site. Comprehensive analytics help you understand visitors’ behavior so you can tweak your site to be more effective, while AdSense provides targeted ads that can be placed on any page and earn you money. Create online forms with free data forwarding to your own e-mail address, take online bookings via an interactive calendar, and add a password-protected area – all without coding! Note: Use of large system fonts may require a higher resolution display. Additional disk resources and memory are required when editing large and/or complex websites. Official stock with manufacturer's warranty, valid worldwide. This item is certified, complying with relevant Australian legislation for use in Australia. Artwork may be subject to change. Our Windows PC software works worldwide, subject to agreed compatibility terms, and is not region locked. In the odd event you have an installation issue, free support is available on the web, or direct from publisher. Item supplied brand new, and may be flat-packed for faster shipping.